What will March weather bring? Last year, Long Island saw four storms, but in years past, temperatures have reached 82 degrees. 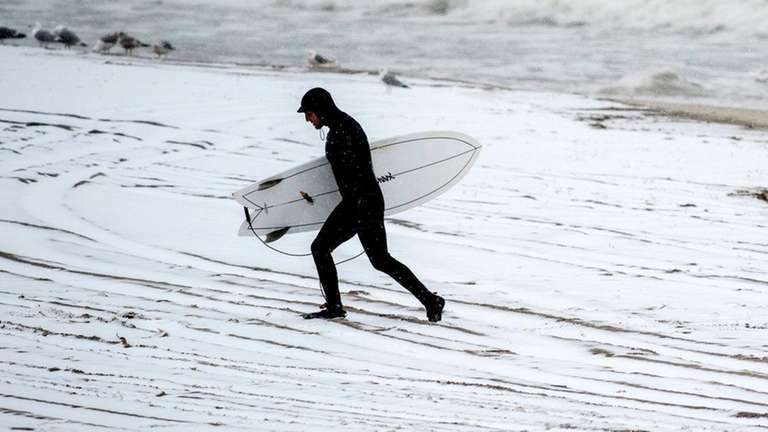 A surfer in Long Beachleaves the snowy beach on the first full day of spring on March 21, 2018. Photo Credit: Newsday/J. Conrad Williams Jr. Surely, you have not forgotten last year with its four March storms, or as Bansen calls them, the "FOUR-easters." Yes, the sun is getting higher, and yes temperatures are becoming milder, making for a backdrop more conducive for rain than snow, said Bansen, News 12 Long Island digital meteorologist. WHICH EMOJI BEST DESCRIBES MARCH WEATHER? Bansen chose the "helpless" emoji to represent March. "Because March can make us feel helpless. Winter never gives up!" he said. But another March emoji also came to mind he said, the "exploding head," because that's "us meteorologists trying to forecast March sometimes!" March sees a big jump on average, with the month starting out with normal daily highs of 43 degrees and overnight lows of 28 degrees at Long Island MacArthur Airport. By month's end, that's 52 degree highs, with 36 the low. On average, the month sees 4.44 inches of precipitation. But, it’s recorded as much as 9.41 inches in 2010. And as little as 0.99 inches in 2012. Normal is 4.5 inches of snow. That blockbuster year, 2018, brought 31.9 inches. We scoured our archives — and memories! 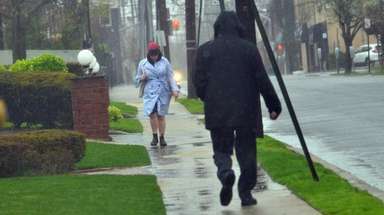 — and here are some of the most notable weather events and how Newsday covered them at the time. Having already designated last March a major snow machine, let’s start off with a different kind of wild. Sun lovers in short-sleeve shirts hit the golf links, with those in more “minimal apparel” heading to beaches — some 14,000 at Sunken Meadow and 25,000 at Jones Beach. Long Island was not complaining. March takes 1st place in the windiest month category, with an average wind speed of 10.6 mph. Back in 1977, wind gusts of more than 50 mph were forecast for March 23, and “were expected to go a long way toward drying out Long Island from the 1.3 inches of rain” that had fallen the day before. Already northwest winds of up to 40 mph had downed plenty of trees and power lines, meaning lots of outages. In addition, “stronger winds from the upper atmosphere” can be dragged down to the surface as warming air rises and mixes with colder air above. As fast as plows cleared roadways, the 40 mph winds pushed snow right back again. With employers closing early, commuters jammed Long Island Rail Road platforms mid-afternoon, making for an early rush hour. Some train delays ensued, blamed on the overcrowding. Sheltering from the cold and snow, one man was holed up in a heated waiting room when, hearing what he thought was his train, he dashed across the tracks and was struck and killed. Other deaths came about from what appeared to be exertion from the likes of shoveling and pushing through the high drifts. Back in the days when Newsday cost 5 cents an issue and phones were not mobile, the telephone company reported the good news that, as the snow was dry and not of the wet, heavy variety, the phone lines were staying put. Newsday also pointed to “things that always happen when it snows,” with photos of a mail carrier out on the job, a snowball maker and a man on skis heading down a hill. 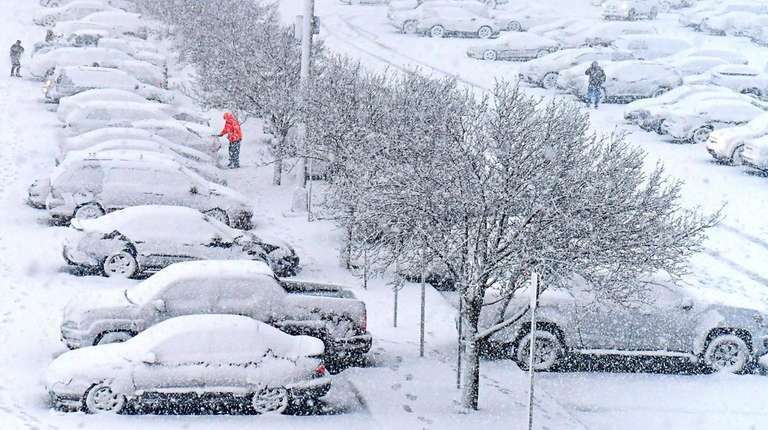 Mark Raskin, of Huntington, remembers the March 13, 1993 blizzard – also known as the “Storm of the Century” for its massive impact on the East Coast. Parts of Long Island saw between 10 and 20 inches fall over the weekend, according to the National Weather Service. Raskin’s son’s bar mitzvah was scheduled for the 13th, a Saturday. Normal is 45 degrees for a high, but the day did warm up to 73 degrees in 2016 and had a record low of 10 degrees in 2005. The most snow on that day was 4 inches in 2017. And don't forget that your clocks "spring" ahead an hour — get it? 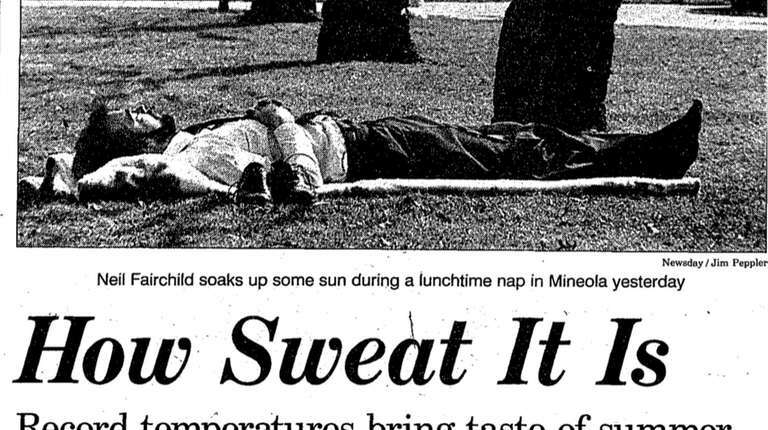 Normal high is 47 degrees, but the day did warm up to 70 degrees in 2003 and fell to a record low of 8 degrees in 1967. The most snow was 2.3 inches in 1993. Normal is 48 degrees for a high, but the day did hit 71 degrees in 2012 and had a record low of 15 degrees in 1967. The most snow was 5.3 inches in 2015. Records are based on data for Long Island MacArthur Airport going back to September 1963.